Responding to public backlash after he voluntarily reissued tens of thousands of parking placards to city school teachers, Mayor de Blasio promised back in May that NYPD would start taking placard abuse seriously. Given that many placard abusers are cops and NYPD has resisted any attempt to reform the placard system, the public had no reason to take the mayor’s proclamation seriously. Six months later, placard abuse is still commonplace. Downtown Brooklyn is a rats nest of illegal parking. In this Streetfilms Shortie, Clarence Eckerson compares the state of Adams Street today to the conditions in 2002. As you can see, employees who work in nearby government buildings in 2017 are as free to double-park in the bike lane as they were 15 years ago. If de Blasio is cracking down on placard abuse, as he said he would, there’s no evidence of it here. Announcing a crackdown and then not following through is worse than never having announced one in the first place. De Blasio, who is already seen as weak and feckless by the cops, looks even weaker now. Just a dumb move by a cowardly man that will make the situation worse in the long run. Streetsblog isn’t being fair. Should have surveyed Adams Street BEFORE the election. No one believe there would be any crackdown afterward. enforcement on double parking in the bike lane on St. Nicholas Avenue from Central Park to 165th St has virtually ceased in recent weeks. I think this crackdown is going to take time. Not that it should. It seems like the placard system is being redesigned. The new Dept. of Ed. placards have a scannable barcode on them and supposedly as other city placards come up for renewal, they will be scanable too. The barcode is coded with where it is acceptable to park, and if the placard is not acceptable for that location, it will automatically print a ticket. This is what I have been told. Meter maids’ ticket machines already scan registration barcodes, so I’m sure it isn’t hard to update them for these. The UFT is going to sue with regard to being cheated out of parking spaces they are promised in their contract by the placards. And there is going to be a sealed settlement that allocates even more of the street spaces around schools to them. No open will claim to be in favor of it. It will just happen. Mark my words. I highly doubt it. Your words are marked with your anti-union labor bias. But we’ll see. I would be very surprised to see it. For my school, we would have no need for additional spaces if NYPD enforced the rules of other placard holders and fake placard holders who park in our presently zoned spots. Download the 311 app and report the illegal parking. Every single time you see it. The result of the report will be updated in the app and you can forward to your elected representative in an email. Rinse and repeat. This issue is actually much worse a little further down the street before the service road starts. North of Livingston Street the bike lane becomes curbside until it merges onto the service road. Placard vehicles are always parked in the bike lane against the curb in a “No Standing Anytime” zone forcing cyclists to merge into a speedway where there are 3 lanes of fast moving traffic. It’s really scary. Give a break! Why was he voted for again? To give more placards, for people to abuse the system. He is doing absolutely nothing for this city. Whenever there is a stabbing a murder a robbery a train incident..do you EVER see him on the news talking about it or making it better? ABSOLUYELY NOT. He just wants to see & get all the freebies he can get. The exact analog is payment for supervising extra-curricular activities suddenly counting toward final salaries for pensions. When the payments were agreed to, it was agreed they would not count for pensions. So no extra money was set aside for it. Years passed. Then the UFT filed a lawsuit at a time Bloomberg was running for President, and he agreed to have it count retroactively. Bingo. $billions out of the pension plan, contributing to its current hole. I suggest the UFT will wait a few years, and then sue to have teachers retroactively paid an extra $300 per month for the parking spaces they were promised but did not get. And then agree to waive the $100 million in back money in exchange for a guaranteed spot. In fact, that deal might have been already made in secret. Who would dare to oppose it? I have done so repeatedly, for years, prompting various versions of the following ‘case closed’ email response. This complaint was one of several made regarding the routine hours-long parking of Tesla auto delivery trucks in the 2-way bike lane in front of the Tesla dealership in Dumbo, but I have had the same experience with 311 bike-lane-blockage complaints in many other Brooklyn locations. Being ever more mindful of the famous definition of insanity – doing the same thing over and over again in expectation of different results – I’m now retiring as a 311 crusader. I’ve had that too. I’ve also had it when the driver moved the car before the police got there (or potentially they were told by the precinct to move the car). I think it’s important to mark the “recurring issue” button but also call/email it to your councilmember. Annoy them politely until they do something. Most calls to 311 are as useful as hitting yourself on the head with a hammer. 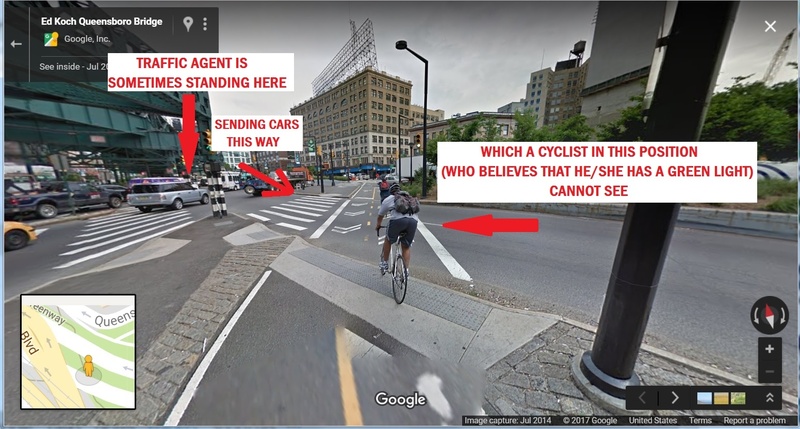 But I had a real shock this week when I got a call from the NYPD Internal Affairs Bureau in response to a 311 call I made about a dangerous situation being created by the placement of a traffic agent at the point where Queens Plaza meets Queens Boulevard. The detective who called me was not familar with the area herself, so I described the problem as well as I could. I also asked her if I could send her the picture you see above; and she seemed interested to see it. I don’t know why IAB called me. I told the detective that this doesn’t have to do with misconduct by any particular traffic agent or police officer; it is a policy failure. But maybe that, too, is within IAB’s responsibility. On the day I called 311, I also went to NYPD’s traffic command at 30-30 Thompson Avenue to make a complaint. I don’t know whether that contributed to NYPD calling me back. While it was nice to see some follow-up, the overall effect of calling 311 is very discouraging: I have called 311 probably a hundred times over the years on several different issues; and this is the only time it has resulted in anything other than a total brushoff. Miswrote, meant Red Hook (76th), not Dumbo (the 84th), of course – the Tesla dealership at Columbia St & DeGraw being the offending party in question. I have in fact spoken to the commander of the 84th about similar recurring bike-lane illegal-commercial-parking blockages in that precinct, where I live, such as the Old Fulton bike lane which is blocked most working days by cars parked by the two adjacent car repair shops. He listened cordially and asked me to report such incidents in real time to 311 – which In told him I had done, easily five or six times or more.